Cabinda is a province that happens to be an Angolan pene-exclave (three fourths foreign lands, one fourth the sea). 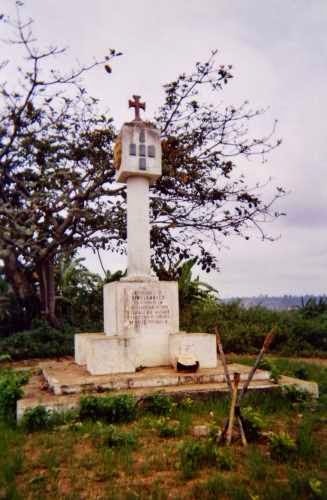 It's an area of conflict between Angolan government and secessionists, that believe that, in the terms of the Treaty of Simulambuco and other documents, although de facto administered as part of Angola it was a de jure separate subject to Portuguese republic before Angolan independence. As far as I know, there isn't a Cabinda flag. Those flags one can find actually pertain to certain to those secessionist movement. 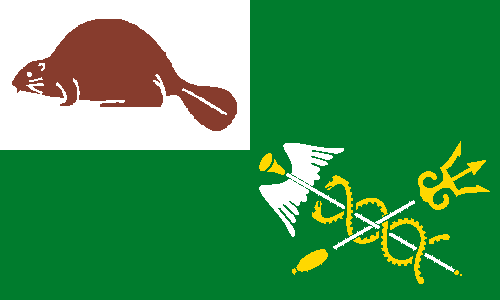 So I decided to create a flag that represents Cabinda uniqueness, but as neutral as I could. 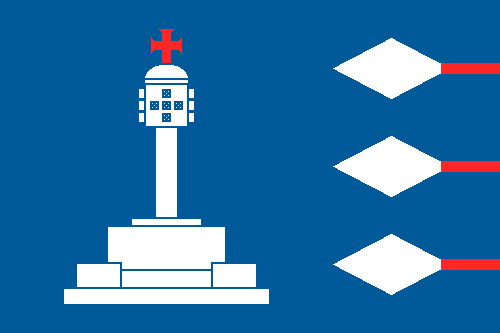 My inspiration for this flag is the Monument of Simulambuco, located where the treaty of same name, incorporating Cabinda as a then-Portuguese Crown's protectorate. I like the visual experiment with the arrows. The result is surely striking. 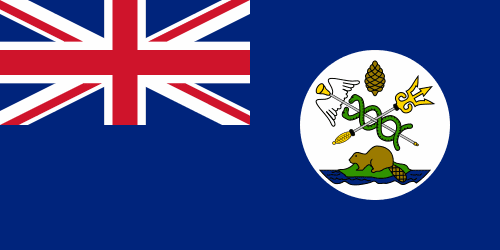 When Vancouver Island was granted a flag, in 1865, it was still an independent colony. The next year, though, it joined British Columbia, now part of Canada, so there's doubts that flag ever flew those times. It's a bunch of things happening there. The badge is based in then-colony's seal:trident for the sea surrounding the island, caduceus for commerce, pine cone for the forests and beaver for fur trade. I don't think the blue ensign-look is the ideal for current usage. 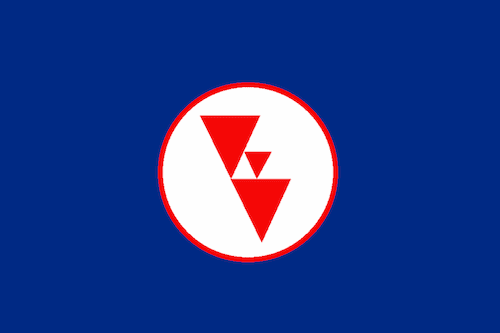 I kept the main elements of the flag. Caduceus and tridents, here. The green stands for the forests. The beaver is on canton because, apart from the fur trade, it's also representing the Hudson's Bay Company, the true proprietors of former colony. 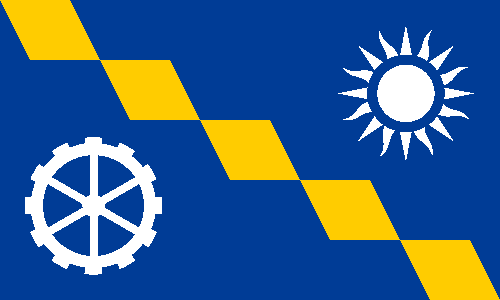 Nothing completely original, but this flag is way more ellegant and easier to be manufactured. My real sorry for post's delay. It's been a busy week. The Organization of American States (OAS or OEA) is an international organization consisting in all independent countries of the Americas (Cuba is not active member). 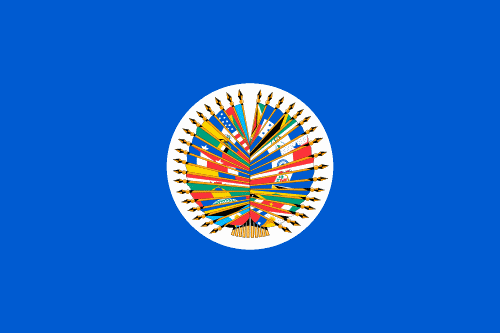 It contains OAS' logo (pieces of the flags of the member states in a flagpole) in a blue background. I consider this design cluttered and lazy. 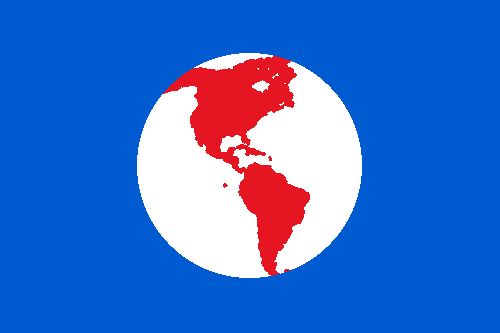 I think the idea of an stylized map is clever, but I'm not happy with its (possibly unintentional) similarity with logo of FTAA, a proposed pan-American (except Cuba) free-trade area. I kept the basic white-circle-on-blue design, but thought the circle like a globe. I painted the continent red because it's a color widely associated with American continent e.g. the former rationale for Olympic red ring. I tried to make this post the most apolitical. 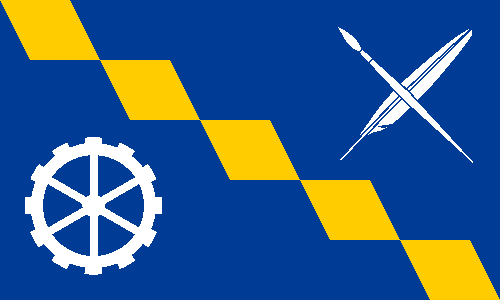 The flag of Birmingham has its use restricted to official use only, so the Birmingham City Council decided to open a contest for choosing a "community flag", for less restricted use. 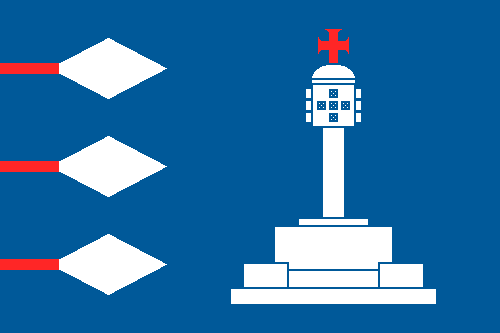 Analyzing local heraldry, I found that the most used elements was the bend of lozenges. It would finally become the basis for my proposed flag. 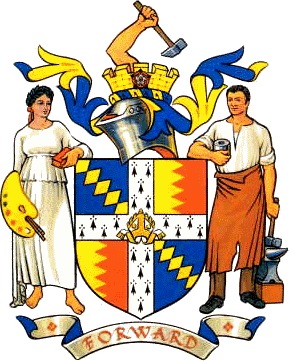 The city's coat of arms focuses in Birmingham's importance at industry, arts and learning. 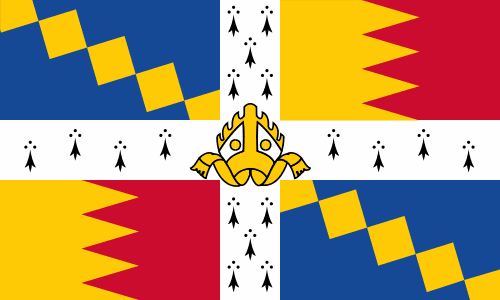 The flag is inspired by the original coat of arms of De Birmingham family. The gear represents Birmingham's industry. The sun is the source of light, representing city's importance in Arts and Education, as well as its role in Midlands Enlightenment. The golden diamonds also stand for Jewellery Quarter. Now it's just hope that any good entry win the contest. Sorry for the unconventional delay. I had to assure the contest was closed and gone through technical problems.